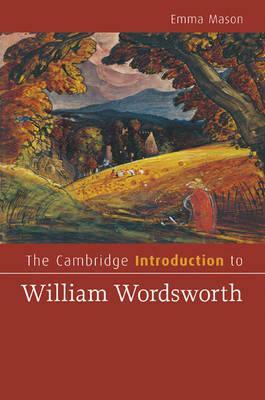 William Wordsworth is the most influential of the Romantic poets, and remains widely popular, even though his work is more complex and more engaged with the political, social and religious upheavals of his time than his reputation as a 'nature poet' might suggest. Outlining a series of contexts - biographical, historical and literary - as well as critical approaches to Wordsworth, this Introduction offers students ways to understand and enjoy Wordsworth's poetry and his role in the development of Romanticism in Britain. Emma Mason offers a completely up-to-date summary of criticism on Wordsworth from the Romantics to the present and an annotated guide to further reading. With definitions of technical terms and close readings of individual poems, Wordsworth's experiments with form are fully explained. This concise book is the ideal starting point for studying Lyrical Ballads, The Prelude, and the major poems as well as Wordsworth's lesser known writings. Preface; 1. Life; 2. Contexts; 3. Poetics; 4. Works; 5. Critical reception; Guide to further reading; Index. Emma Mason is Senior Lecturer in English at the University of Warwick.